"23. I like to drink a Manhattan after a long day." And I got to thinking, "That makes sense, what else would a 'CityKin' drink but a Manhattan?" It has been called the king of cocktails—strong, urbane, and simple. Made famous by Frank Sinatra and the Rat Pack, it originated at the Manhattan Club in New York City in the early 1870s, where it was invented for a banquet hosted by Jennie Jerome (Lady Randolph Churchill, Winston's mother) in honor of presidential candidate Samuel J. Tilden. The success of the banquet made the drink fashionable, later prompting several people to request the drink by referring to the name of the club where it originated — "the Manhattan cocktail." Mnahattans include whiskey, sweet vermouth, ice, and bitters. Commonly used whiskeys are rye (traditional choice), Canadian, Bourbon and Tennessee. Proportions of whiskey to vermouth vary, from a very sweet 1:1 ratio to a much less sweet 4:1 ratio. The cocktail is often stirred with ice and strained into a cocktail glass, where it is garnished with a stemmed Maraschino cherry. A Manhattan is also frequently served on the rocks in a lowball glass. Bitters are frequently omitted from a Manhattan unless specifically requested; however purists maintain that bitters are required to offset the sweetness of the whiskey and vermouth. 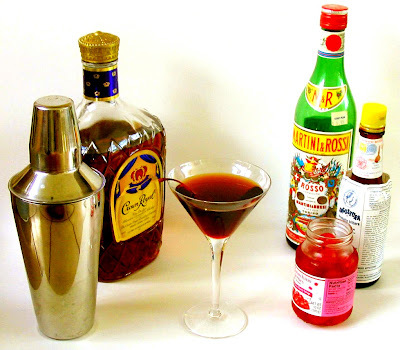 Using more vermouth and less whiskey to create a less potent Manhattan may actually make the drink taste stronger because of the intense flavor of sweet red vermouth. Rob Roy-made with Scotch whisky. Dry Manhattan-dry vermouth instead of sweet, served with a twist. Perfect Manhattan-equal parts sweet and dry vermouth. Brandy Manhattan-brandy rather than rye. Metropolitan-3-to-1 ratio of cognac or brandy to vermouth. Cuban Manhattan-Perfect Manhattan, dark rum not whiskey. Latin Manhattan-equal parts white rum, sweet and dry vermouth, and a splash of Maraschino cherry juice, served up with a twist. Womanhattan-1 part grenadine, 2 parts rye, with a twist. special touches, usually a more expensive whiskey. SoCoMan (Southern Comfort Manhattan)-Southern Comfort with dry vermouth, as using sweet vermouth with Southern Comfort would often be considered an overdose of sweet; however, some people still like these made with sweet vermouth, as that is the tradition for a Manhattan. Perhaps we could persuade CityKin to share his special recipe in the comments. Local clubs could make it a house specialty, the OTR Manhattan. It's my drink of choice as well, strangely enough, usually ordered at Mr. Pitiful's on a Friday night. I would never have one in a martini glass as shown in the photo. I think a tumbler, lots of ice and 2:1 whiskey to vermouth and I do prefer the dash of bitters. I them because it is hard to make a bad one, as the vermouth covers any bad whiskey. Interesting tidbit about Tilden. He won the popular vote in 1876 but there was a dispute in, where else? Florida. While he spent his time researching the history of electoral counts, the Republicans just boldly took the election. What was that about history repeating?